Recently I have been coming across a lot of quilting related stuff. Maybe this is due to my making a (rather conceptually planned) quilt myself (as readers of this blog will know), which made me pay more attention to this, or maybe this is a genuine trend that has finally reached my conscious mind. For me quilting was all around for the last couple of months. I have a number of ‘stashes’ when it comes to crafting materials (although most of them are not actually in stashes, but in boxes, or better they aspire to be in boxes and one day I will surely get round to organising them a bit better so that they actually are in boxes rather than occupying all sorts of surfaces in my flat, including – I am ashamed to say – the floor), some stashes relate to bookmaking and printing, some to sewing and knitting, some to painting. Some have been accumulated for the sole purpose of running workshops, these include a bit of everything even some random materials. But of course there are also more metaphorical stashes you can find at work, even if you are not working as a quilter. A colleague of mine recently mentioned that she had started a file documenting her achievements so that she wouldn’t forget about them when it comes to putting together submissions for the next Research Excellent Framework (if you’re in UK Higher Education you will know what this means, if you are not consider yourself lucky). What she is doing is building her stash. When I started thinking about my Learning and Teaching quilt, there were always some patches that represented what I had done, and some that represented ideas to pursue in future. 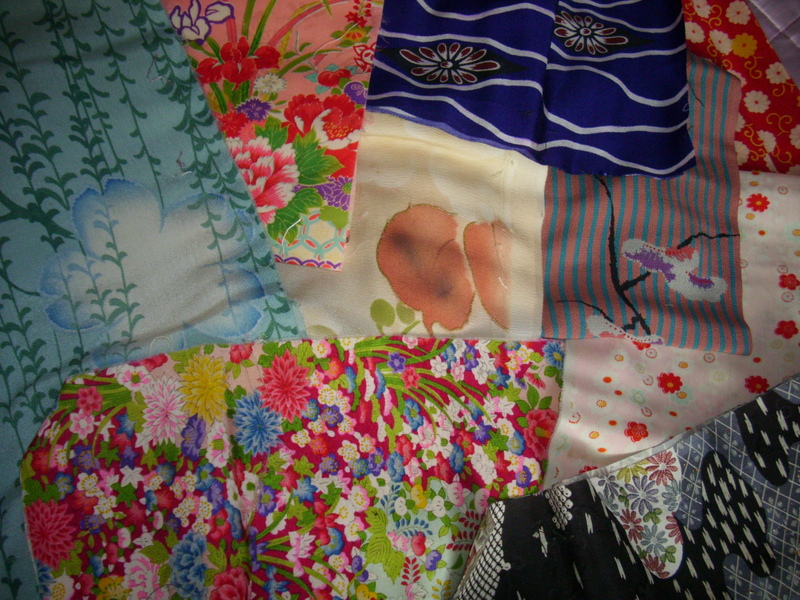 I have recently had to put together a CV and was reminded of how much that is like laying out the pieces of material in a more traditional patchwork stash, thinking about here is what I have, these things go together, these might clash too much, these are too much alike to include all of them. There is some satisfaction in knowing that it might feel like business as usual most days, but that actually the outcome of these oh-so-ordinary days could be likened to a piece of fabric that one day will help me tell a story by putting a lot of them together. And I find it so much easier of thinking of what I do as little patches of fabric than of lines in the bullet point list of a CV. The great thing about thinking about your career this way is that you can also see what is missing – where do you need a link? where do you need something more colourful and bold? So it becomes a tool for planning, nt just a tool for looking back. I wonder whether this would be a good way to encourage students to think about postgraduate study? So, after all the embroidery going on over the last week or so, I declared enough was enough and got out the sewing machine to finally quilt the patchwork. As with all design processes I have ever undertaken, it was a good thing that a deadline was looming: the portfolio for HEA accreditation needed to be handed in at Staffordshire University yesterday. And while I had been going back and forth in my head about whether to actually hand in the quilt as part of it or not, I thought it would be nice to have the option. The actual quilting transformed this piece of work, making it look much more ‘finished’ (although it took way longer than I expected it to, I’m glad I did it on a non-work day, because I wouldn’t have been able to complete it in just one evening). But what about the portfolio? While all the embroidery was going on, I was also busy writing my annotations and sorting out my references. And during a chat with a colleague of mine about the portfolio, he commented on how conversational my writing was and said that on reading the first bits he thought I was going down the interview route. Now, I am ashamed to admit, but this hadn’t really occured to me. It should have, as I do a lot of work with genre writing (lots of cream embroidery on my patchwork), but my initial plan had been to get all the information down (conversationally as I find that easy as a first draft) and thenn ‘academic it up’ with making it more formal. However, if the whole point of the portofolio was to represent my practice, then using a slightly alternative genre made sense. So, inspired by the quilt itself, I set about rewriting the whole thing, turning it into an interview with myself, trying to explain the quilt concept, why there was only going to be one side of it (for now), and trying to guess the questions that might come up while viewing this piece – and answering them. Of course that made me end up with a combination of the annotations and the reflective commentary (which might have gone slightly beyond the word count), but I think I ended up explaining the concept, how it relates to my portfolio of work, and how it is not only reflective practice in action, but also reflecting my practice. The work on the quilt as such is not finished. I am working on the other side – a map that locates my different practices in relation to each other – and am doing more embroidery on that. And I keep updating my Post-it Patchwork, as this has become a valuable working document that helps me plan future projects. 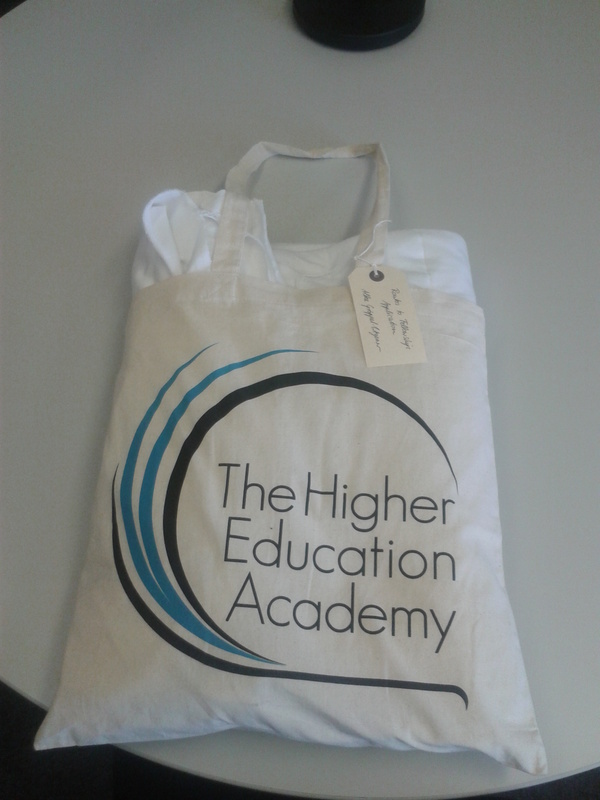 Recently I have been thinking a lot about the Higher Education Academy (HEA) accreditation, which is aligned to the UK Professional Standards Framework. This has become more and more important in the Higher Education climate in the UK, so much so that universities (my own included) are now setting targets as to how many of their staff need to be accredited by what time. As part of this, I have been thinking about this idea of a portfolio, and alternative presentations, particularly during some conversations with Carolyn Bew, the discipline lead for art and design, where we were wondering how much of this needs to be writing-based (which, of course, can be a problem for art and design based professionals, some of which don’t have much confidence in their writing abilities). And we were thinking that it would be nice to develop a slightly ‘different’ type of portfolio as an example of a more visual approach to the whole thing. I’m quite interested in alternative ways of presentations anyway (and I have talked about some of them on this blog), and when one of the participants of one of my workshops gave me a paper on patchwork writing, I began thinking about the direction of a quilt. I think a portfolio has the wrong connotations – for me having had two so far in my professional life, one concerned with graphics, one full of theatre designs – a portfolio, to me, shows finished work. 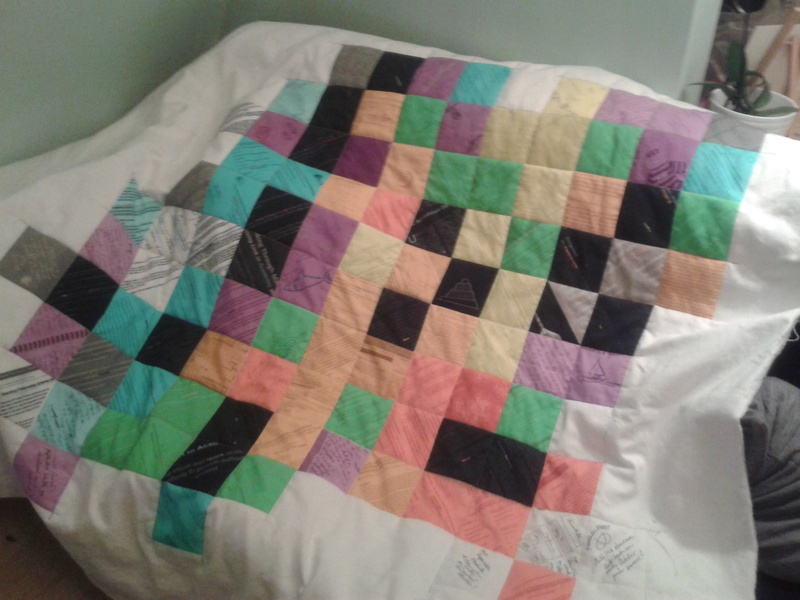 A patchwork, or a quilt, links the separate pieces through thread, and it can be presented as very much unfinished, representing the on-going journey of a teaching professional. So I was thinking of this ‘Accreditation Quilt’, and actually started designing it – what bits to put in, how to colour code it, but it didn’t really take of. Don’t get me wrong, I think it was a nice idea, but it wasn’t quite there. And then I realised that I was going about it the wrong way. What I was trying to do was trying to find a different way of representing the information in the prescribed portfolio. Why was I doing that? To stand out? To have a bit of fun? To make a point? None of them brilliant reasons for doing this. A couple of days later I was filling in a form as preparation for my yearly appraisal – and I really struggled with the form. I am doing so many separate things, some of which are somehow connected, I found it really hard to condense them all into bullet points that would make not only sense to somebody else, but maybe most importantly to make sense to me, to allow me to see the patterns and figure out what I want to work on more in future. And I was thinking that I need to find a better way of organising this information… what have I achieved, what didn’t quite work, what do I want to achieve in future? So I decided to design a quilt. And while I might be able to use it for the accreditation to Senior Fellow of the HEA, that’s not really why I’m doing it. I’m doing it because I want to be able to visualise where I’ve been and where I want to go. I want to reflect on this not just with a bullet point on an appraisal form (because that’s what we have to do for the university), I want to see whether there are patterns and directions. I want to develop an overview that at the moment I don’t think I have, because I’m focusing on too many bits right now. 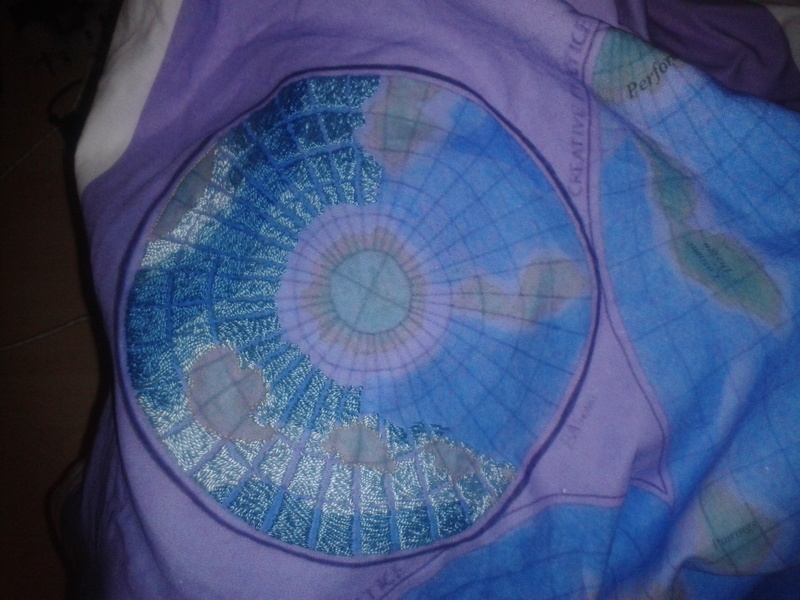 Anyway, coming to this blog soon: news of the development of my very own Indivisual Evaludation Quilt. I probably won’t blog about every little piece of detail (I don’t want to bore you with my meandering career), but I will try to keep you abreast of some examples and how the shape, etc. evolves. 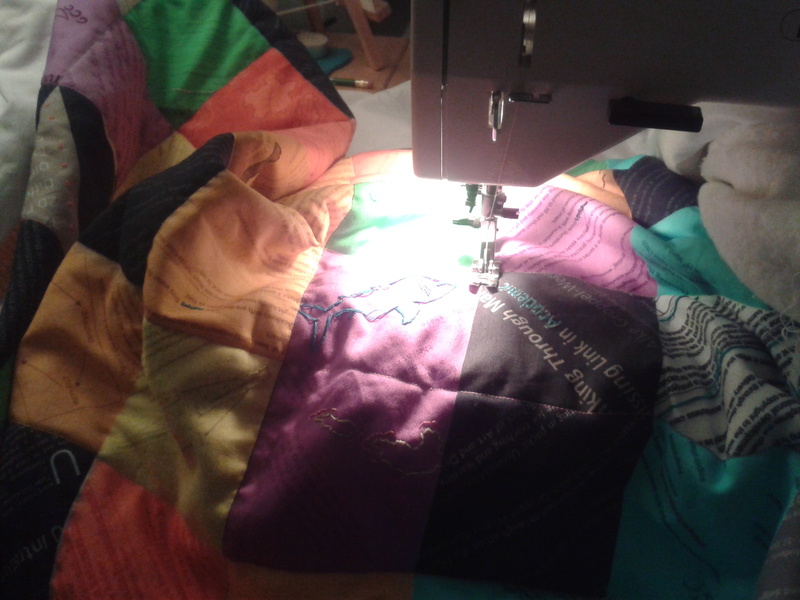 Why not join me in this endeavour, and we can form a virtual (or perhaps real) quilting circle!